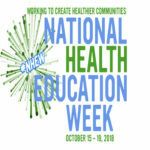 For more than 20 years, the Society for Public Health Education (SOPHE) has celebrated National Health Education Week (NHEW), in collaboration with the Department of Health and Human Services, during the third week of October. Join us as we work together to raise awareness of the importance of our future health education specialists in improving consumer health and wellness. To increase national awareness on major public health issues and promote a better understanding of the role of health education. To increase the awareness of health education specialists’ capacity in the community and schools and to promote the health of society. Health education specialists offer knowledge, skills, and training that complement health providers, policy makers, educational experts, human resource personnel and other professionals whose work impacts human health. Reduces costly premature deaths and disability. Health education focused on prevention reduces the financial and human costs spent on medical treatment. Chronic conditions, such as diabetes, heart disease, and cancer, consume more than 75 percent of the $2.2 trillion spent on health care in the United States each year – the equivalent of about 2.5 economic “bailout” packages (CDC, 2013). Spending as little as $10 per person on proven preventive interventions could save the country over $16 billion in just five years (RWJF, 2008). Health literacy is a large determinant of health status and without these components offered by health education specialists, members in each community can be greatly affected. Health education specialists [health educators] teach people about behaviors that promote wellness. Use this pdf in your promotion materials.